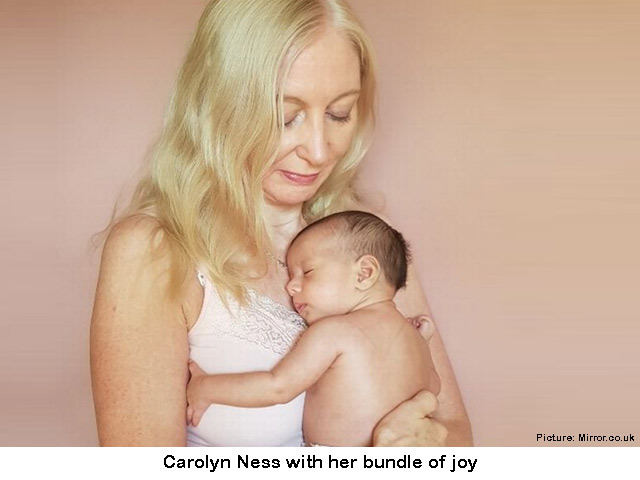 Carolyn Ness, a single woman of 58 years, recently gave birth to a baby boy she conceived via the embryo adoption process. 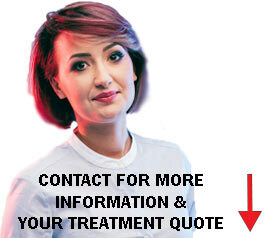 According to NHS guidelines, women under the age of 40 can be get upto three IVF cycles, while those between the ages of 40 and 42 are eligible to get only chance at IVF. The chances of success in IVF after the age of 40 become much lower and the pregnancy becomes riskier. “I had given up home that anyone would call me Mummy,” she told the Mirror. Although she had hoped to start a family while still in her 20s, she only met her partner by the time she turned 30. After separating from her husband, Carolyn continued to date but never found anyone she wanted to start a family with. She even emigrated from Fife, Scotland, to Sydney, Australia, to start a new life and possible, find love. “I made friends, but it devastated me to hit 50 and still not be a mum,” she says. Desperate to have a family, she considered adoption but found the process to be long and complicated. Carolyn then started to look for IVF options but she was considered too old and even the private clinics would not offer it to women over 50. Female fertility usually starts to decline around the age of 35, and the chances of conceiving with your own eggs become smaller as you grow older. Infact, growing age is one of the most common reasons for IVF failure. Related read: How to test female fertility? Then a friend asked her to consider embryo adoption—a procedure in which eggs from an unknown donor are fertilized with an unknown sperm to make an embryo that is transferred to your uterus. At her age, the procedure would only be offered in Cyprus or India, where the IVF industry is not strictly regulated. Not only was it more liberal, IVF in India is also much lower priced, so it became the option of choice for Carolyn. She went to Dr. Rita Bakshi in New Delhi and spent around £4,500 for the IVF procedure. “I wanted my baby to grow inside me. If I did have any eggs left, they would not be not be good quality at my age, but I knew that if my womb was healthy, there wasn’t any reason why I could not sustain a pregnancy,” says Carolyn, even as doctors around the world caution women about the risks of getting pregnant after a certain age. She was aware of the repercussions, but she decided to go ahead. She spent another £1,000 on tickets and went on what she describes as “a great holiday,” which comprised traveling on rickshaws and even visiting the Taj Mahal in Agra. She selected an egg donor—a 21 year old young Indian woman, who liked dancing; and a sperm donor— A Caucasian American, who was 6ft tall and worked in IT, had dark hair and brown eyes. “His donation had been imported, due to a lack of Caucasian donors in India,” she explained. Egg donation is strictly an anonymous process in India, so the donor never finds out about the parents who might have had a baby with her eggs. This process has been condemned in some parts of the works due to ethical concerns that this arrangement robs the child of the right to learn about his genetic parents. However, in India, and several other parts of the world, it is commonly practiced. Three embryos were transferred to her womb before she flew back home to Australia. In two weeks time, her pregnancy test came out positive and a blood test later confirmed that Carolyn was indeed going to be a mother. She regularly saw her doctor and found out she was having a baby boy. She named him Javed. Carolyn exercised and meditated throughout her pregnancy and Silvana, her best friend, agreed to be a birthing partner. On 6 November 2017 Javed arrived at 37 weeks, weighing 5lb 20z. Friends of Carolyn expressed their concerns and asked if this was something she really wanted. “They warned it would be exhausting, I’d miss my freedom and resent the sleepless nights, but they were all mothers already, they had no idea how much I wanted to give up my freedom to love a child like they had,” she said. However, Carolyn says she is fully aware of the “ethical implications of forcing a pregnancy at my age” and has given a thought to the fact that she might not be available for her child for a long time. She has already signed up her sister Rhona, five years younger to her, and her best friend, Silvana, who is ten years younger. Both the ladies have assured that they will be there to care for her child. While justifying her decision to have a child so late in life, she also makes a valid point—you can have children at a younger age and still not be there for your child. Is she the oldest British mother? 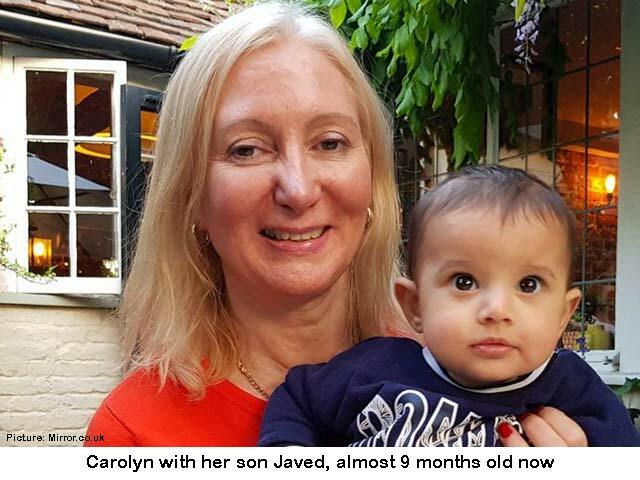 Although in India there has been an instance of a 72-year-old woman becoming a first time mother, Carolyn is definitely the oldest British to have her first baby at 58. She has a lot of plans for him but will definitely not be kicking around football with the boy. She will turn 60 in March but Carolyn insists: “I have plenty of energy and I don’t even mind the sleepless nights. Anonymous gamete donation, lower cost of IVF in India, and the liberal rules there allowed Carolyn to have a baby at 58. However, that may not always be the case. Many of our doctors, in India and other countries, refuse to accept patients above the age of 50 years, on ethical grounds. These are some odd instances of old-age pregnancies but doctors generally advice against it, in the best interest of the mother and the child. Do you know anyone considering IVF in older age? What do you think? A single British woman, who was divorced many years ago, went overseas for embryo adoption. She was considered too old for IVF in Australia but the liberal rules in India allowed her to gave birth to a baby boy at the age of 58. Read the story of Carolyn Ness and find out what drove her to become a single mother when she was almost turning 60.